In Europe, political pressure has led to economically unrealistic policies on immigration. Ill-judged and artificial barriers between current and would-be residents helped create the conditions for Sunday’s Mediterranean shipwreck, in which 700 people are feared dead. In some ways, Europe may appear an odd destination, since it is in the midst of labour market crisis. The European Union’s 9.8 percent unemployment rate is a clear sign that jobs are scarce. The young people who constitute the overwhelming majority of illegal immigrants must compete for work with the 4.85 million unemployed legal residents under the age of 25. But the would-be migrants do not think Europe offers depressing stagnation. By the standards of the countries they are living in, Europe offers stability and opportunity. Many of the illegal migrants come from countries beset by civil wars or political persecution. Refugees entering Europe from Syria, for example, whether or not they qualify for asylum, obtain something of incalculable economic value: a safer place to live. They calculate that the chance for a new and better life outweighs the risk of drowning on the short journey and the many dangers of living illegally in Europe. Other migrants are leaving primarily to escape desperate poverty. Their calculation is also rational. The average GDP per person in sub-Saharan Africa, where many of the seaborne migrants come from, is $3,720, the International Monetary Fund calculates. In the EU, Eurostat comes up with $29,211. With that wide a gap, jobs and living conditions that count as illegal and oppressive in Europe may still be far better than anything likely to be available at home. Even years of work at a sub-minimum European wage can produce an acceptable return on the high cost of the illegal journey. The difference between source and destination countries is so wide that in practice many people will try to migrate, no matter how meagre the rescue efforts in the Mediterranean and how much effort is dedicated to catching people-smugglers. When the legal migration channels are narrow, there will be illegal crossings and tragedies on the sea. Overall, the smugglers profit and the migrants suffer. If economic realism helped guide immigration policies, the seeming unquenchable appeal of Europe would be central to the debate. However, many European voters do not seem to understand the economic pressures which shape actual migration. It is not only the pressure to come that is ignored. Voters also ignore the strong argument that free movement of people helps increase prosperity in developed economies. Even before considering the benefits to migrants – who are valuable in themselves – established residents of developed country destinations generally gain more than they lose from the arrival of mostly young and energetic workers and consumers. Almost every study shows that the effect of migration on domestic wages is minimal. Voters are not listening, or perhaps they are thinking less about economics than about culture and crowding. In any case, the political debate in Europe seems stuck. As in the United States, there is no strong popular support for more open borders or for regularising the status of current illegal residents. But there is widespread support for tighter restrictions on migration. It may be that the European sea tragedies will soften attitudes, although the U.S. precedent, where immigration reform has been stalled for years, is far from encouraging. Politicians trying to be humanitarian without losing too many votes often promise tougher enforcement of the existing laws. In Europe, the police effort has been undercut by the descent of Libya from dictatorship to failed state. The country has become the centre of people-smuggling. Part of the answer lies with enriching the source countries to make the case for migration less attractive. That is worthy, but it is unrealistic to expect much change soon. While many poor countries are gradually getting richer and safer, life is still much sweeter and richer in Europe. European leaders undoubtedly want to eliminate tragedies like Sunday’s. The first step is to recognise that for the passengers who were stuffed into that doomed ship, Europe was truly a blessed continent. The second is to appreciate the fact that Europe, in common with other developed countries, has much to gain from immigration. 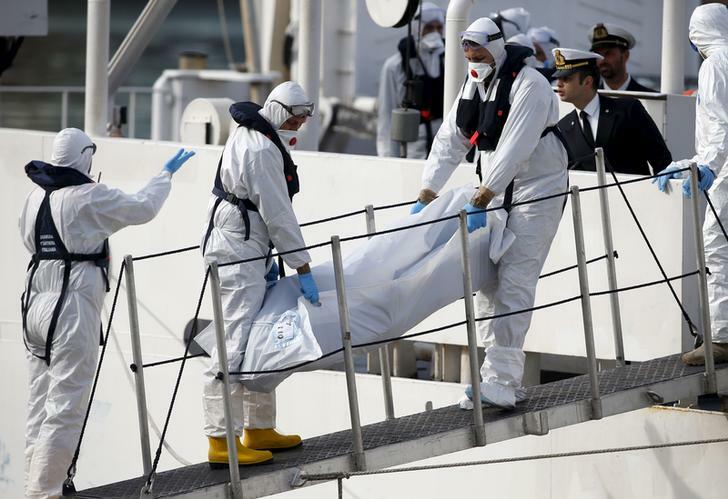 Italian coastguard personnel in protective clothing carry the body of a dead immigrant off their ship Bruno Gregoretti in Senglea, in Valletta's Grand Harbour April 20, 2015. As many as 700 migrants were feared dead on Sunday after their boat capsized in the Mediterranean, raising pressure on Europe to face down anti-immigrant bias and find money for support as turmoil in Libya and the Middle East worsens the crisis. European Union foreign ministers met on April 20 under pressure to help save desperate migrants willing to risk their lives crossing borders illegally. Officials said there had been at least 700 people on board a vessel that was wrecked on April 19 off the Mediterranean coast of Libya.